What’s New with Kenny and Jennifer? Praise God for a busy and eventful early summer! 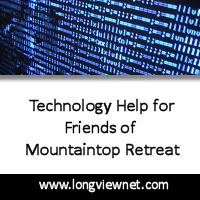 We have been at Mountaintop Retreat for just over a year and are now well into our second year of camps. God blessed us this year with jobs we love, a safe move to Colorado, and the opportunity to impact hundreds of youth, families, and church groups through our ministry here at camp. Thus far, in June alone, we have had over 160 kids and about 30 volunteers, as well as cooks, a mowing crew, and a few neighbors who came to help. More than eighteen youth made decisions to accept Jesus, and countless others were convicted to improve their walk with Christ. Praise the Lord! Read more by downloading this Adobe Acrobat PDF. Mountaintop Retreat Presents a Free Christmas Concert Join us for an afternoon of live Christmas music, food, and fun for the whole family! Where- 339 Bible Camp Rd, Montrose, CO.